Printing inks are a customer- and applications-specific formulations business. There are two major segments—commercial printing/publishing and packaging. Printing inks are also categorized by process: lithography, rotogravure, flexography, and digital printing, the newest and highest-growth process. A reputation for both quality products and technical service is essential for a printing ink company. The five most common printing processes (in order of their worldwide market shares) are lithography (frequently referred to as offset), rotogravure (commonly called gravure), flexography, screen printing, and letterpress. Several other traditional printing processes account for a very small portion of printing revenues. Increasingly, nonimpact imaging processes—inkjet printing and electrostatic printing—are gaining a larger share of the print market. Since nonimpact, digital imaging is cost-effective for short runs and individualized printing and has essentially instant turnaround, its competitive space is different from that of conventional printing processes. Offset/lithography, gravure, and flexography are the three most-used printing processes in the world, accounting for about 94% of the world market. This report covers inks consumed in impact printing using processes that include offset/lithography, rotogravure, flexography, letterpress, and screen. Information on inkjet inks, which are used in digital or nonimpact printing, is also presented, as these inks have become an important complement to traditional printing. 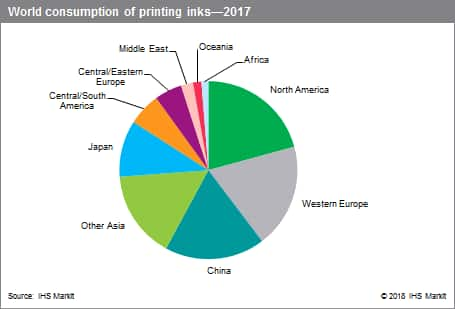 However, data on inkjet inks are limited and are not included in the global and regional consumption totals of the report. Lithographic printing, accounting for about 46% of the market, includes heatset (oil-based inks used mainly for commercial printing but also for package printing), coldset (oil-based inks used mainly for newspapers, flyers, and magazines), conventional sheetfed (oil-based inks used mainly for commercial printing and publication but also for package printing), and oil-based overprint varnishes. The use of offset letterpress is relatively small. Offset printing will continue to be the preferred method for producing large run lengths. However, the market is demanding increasingly shorter run lengths. Nanographic printing presses are expected to address this need. Plateless digital (inkjet and electrophotographic) printing is gaining wide acceptance with customers in addition to plate offset printing. However, because of the advantages and disadvantages of each system, there is a trade-off between plate offset printing and plateless digital printing. Gravure is estimated to have a share of almost 28% and includes solvent-based liquid inks. The major applications are commercial publication and film packaging. Packaging gravure has lost some market share to flexo as shorter runs in packaging became popular. However, the high quality of gravure continues to be a competitive advantage in the packaging sector. Some growth opportunities for gravure print in packaging are seen, particularly in China, India, and South America. There are good opportunities for gravure where high-volume print runs are required. Electronic media have fragmented the advertising market, reducing advertising spending in print media, and causing the closure of magazine and newspaper businesses. However, digital imaging, especially through inkjet printing, is increasingly becoming a major part of the “traditional” printing business. Computerized platemaking and printing stations (typically inkjet) that customize each printed product are becoming common technologies. Customization and quick turnaround for short runs are major customer demands being placed on the printing industry, and ink manufacturers must produce inks that accommodate these needs. New technologies that allow the printer to come up to color quickly and produce consistent color throughout the run are being used. The transition toward high-value digital and energy-cured inks will continue. In the end-use sector, packaging has moderate to highest growth whereas the publications market continues its shift from ink media to internet and other electronic alternatives. Some packaging printing is also moving to China. Overall, the challenges facing the industry include cost reduction, securing raw material supply, complying with regulations, and sustainability issues. The printing ink market continues to face severe pricing pressures. Oil- and petrochemical-derived products such as mineral oils, solvents, carbon black, resins, and intermediates are critical raw materials for producers of inks. Geopolitical risks and commodity investor activities and the resulting volatility in oil and feedstock costs make the future of these products difficult to predict. Some ink raw materials, such as rosin and titanium dioxide, are subject to fluctuations in demand and major variation in their price. Last but importantly, the purchasing power of other industries using the same raw materials (e.g., the tire industry in the case of carbon black, and the adhesives industry in the case of resins) is another factor complicating the ability to secure raw material supplies. Printing inks used in publishing will remain challenged by continuing global growth in electronic media. Publication and commercial printing sectors are mature markets in the West but can offer growing business in developing markets such as China, India, Africa, and the Middle East. The challenges to sustainable development will include higher resource efficiencies in the use of raw materials, energy, and materials for product packaging; increased use of biorenewable raw materials; and printing inks with improved deinkability characteristics that enable optimum recyclability of printed graphic paper. The global printing inks market is expected to grow moderately by about 1.5% annually on average during 2017–22. North America is the largest regional market, in terms of volume, followed by Western Europe, China, Other Asia, and Japan.